Have you ever seen a presentation in which the text was jumping around from slide to slide? On each slide, the title and text were in a slightly different location. It made your eyes hurt, didn’t it? 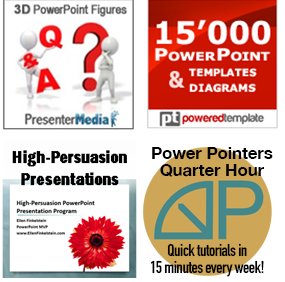 Or maybe the presentation’s titles used several different fonts or font sizes. Looked chaotic, yes? When you’re editing a presentation and trying to get the titles and text to fit, you sometimes move and resize the placeholders a little here and there. But the end result is that your titles and text jump around from slide to slide in a disconcerting way. Or, you may change fonts or font sizes, but you get a look that just doesn’t hang together. How do you get your placeholders to all line up exactly again? How do you get all your text to have a single font and font size, just the way it is in the slide layout? With the slide in Normal view, right-click just off the slide. Occasionally, this doesn’t work. In that case, create a new slide with the layout that you want and copy the content from the old slide to the new one. Tip: You can select multiple slides in the left-hand pane (click one, press the Shift key, and press the last slide that you want to select). 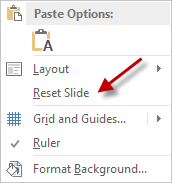 In that left-hand pane, right-click one of the slides and choose Reset Slide.